Gaga was expected to sport an extreme ensemble — and did just that — in this custom-made, crystallized Armani gown, two-tone wig, heelless platforms, and out-of-this-world accessory. On the night she would go on to win five Grammys, including Best New Artist, Alicia made the mistake of pairing a sheer sari with a chintzy tank top, embroidered jeans, and bejeweled sandals. 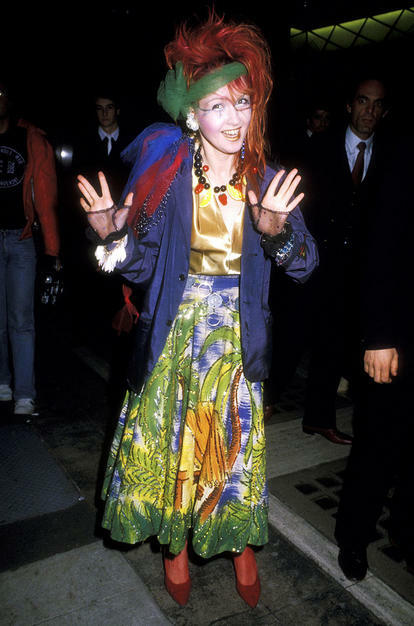 Cyndi’s debut album, “She’s So Unusual,” dropped in October 1983, and she solidified her unusual status the following February when she hit the red carpet in this signature eyesore. Everyone was hoping the pop tart would continue her comeback in an award-winning look, but Brit bombed in a black widow-inspired Dolce & Gabbana lace dress and bodysuit. Wizards? Jesters? Renaissance festival goers? 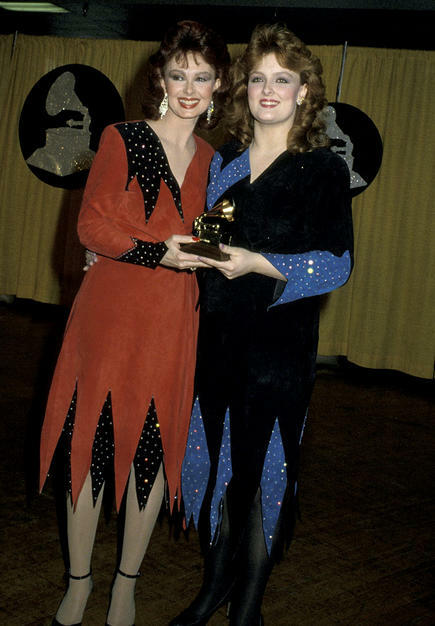 You make the call because we certainly don’t know what look The Judds were trying to achieve. 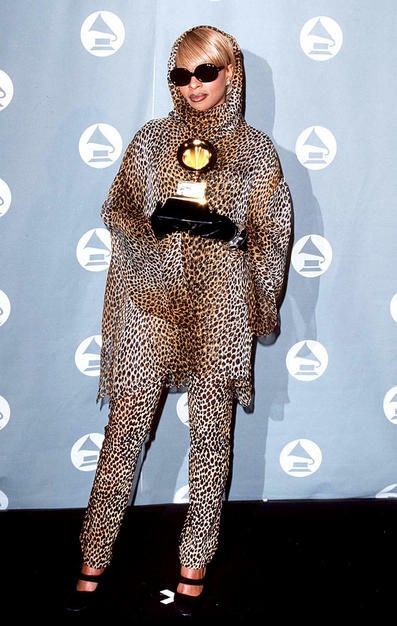 We’ll let the overabundance of powder and the unnecessary bindi slide, but we can’t forgive Gwen for attempting to wear her granny’s curtains to the Grammys. An extremely pregnant M.I.A. 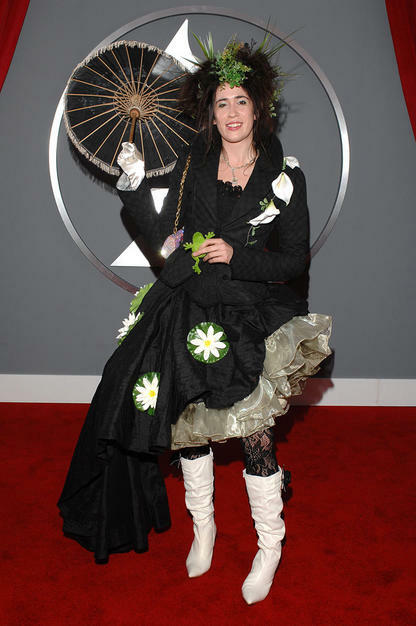 deserved big props for showing up at the Grammys on her baby’s due date. Unfortunately, she didn’t get any props for her flouncy frock and matching high-tops. Perhaps it’s just us, but we doubt Walt Disney ever imagined “Minnie Mouse” and “latex” would appear in the same sentence. Discolored wig? Check. Tattered screen door panels? Check. 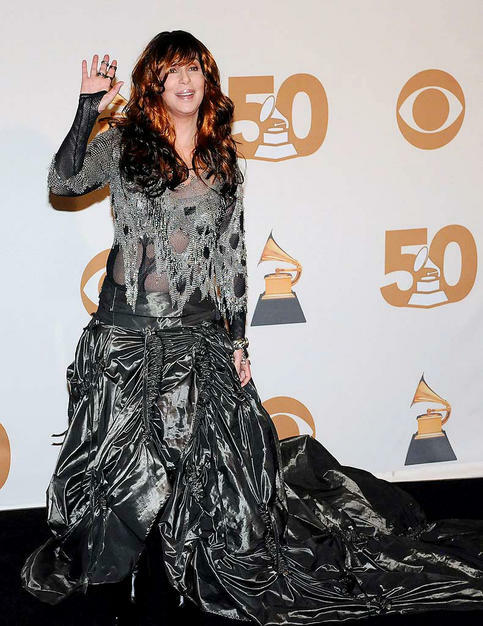 Approximately 14 crumpled trash bags? Check. Cher in all her ridiculous fabulousness? Check! Truth be told, we’ve never seen Lil’ Kim this covered-up. Yet, she still looks like a hot mess. Go figure. If it’s cold enough to wear a floor-length fur coat, perhaps wearing something other than a corseted romper under said coat would have made more sense. Just a thought. 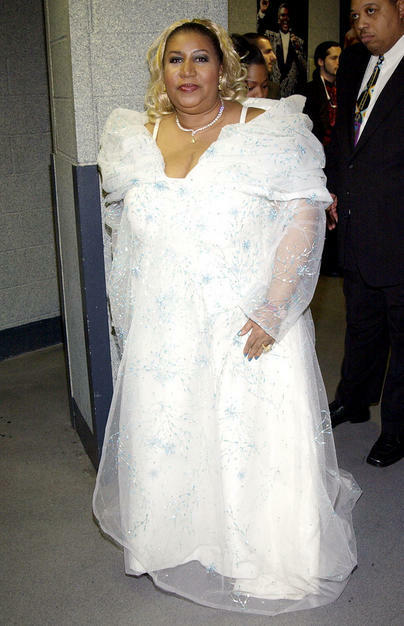 She may be the Queen of Soul, but she’s also the Queen of Bad Style. When did the Grammys become an off-the-Vegas-strip showgirl spectacle, featuring over-bronzed flappers? Answer: 2004, when Xtina arrived. Some of you may disagree, but there is such a thing as too much cheetah print. BTW, sunglasses indoors … fail. Yes, it was 1977. No, that’s not a legitimate excuse. Then again, we love Dolly, and she can do no wrong. Well, except for those press-on nails! We feel sorry for that little frog in Imogen’s hand. Don’t you? 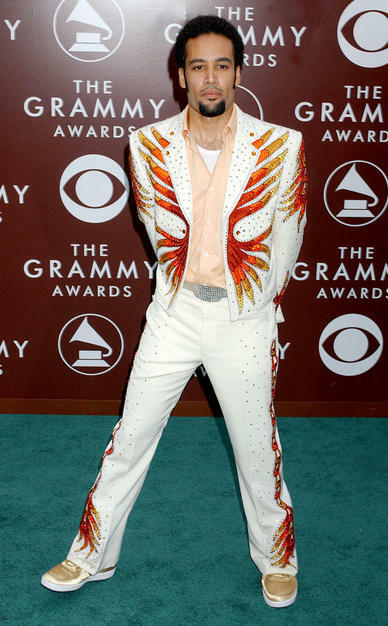 Minus the peach-colored button-down shirt, we’re kinda digging Ben’s bold, fire bird-adorned suit … despite its wackiness. Why on Earth would one of the world’s most gorgeous women hide her fantastic figure under a floor-length, purple leather coat? More importantly, why on Earth would anyone accessorize with an extra-long pink scarf, salmon-colored gloves, and costume jewelry? Paula’s canary-colored catastrophe featured an overly ruched bodice, a bizarre metallic shoulder piece, and an unnecessary belt, while her head featured a Bride of Frankenstein-like ‘do. Pajamas? At the Grammys? Apparently if you’re Madonna, you can get away with wearing anything. Hopefully this isn’t the fashion of the future. If it is, we’re all doomed. 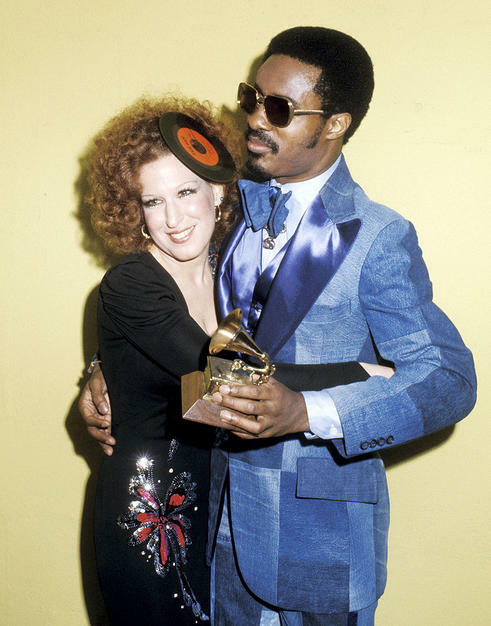 Stevie’s suit was sharp for ’75, but Bette’s record-adorned dome fell flat. The 80’s … when neon parachutes and bedazzled jean jackets were all the rage. Those were the days! J.Lo in the infamous green Versace “jungle dress.” ‘Nuff said. A year after the Versace scandal, Toni dared to out diva J.Lo and ended up looking like an undone mummy.